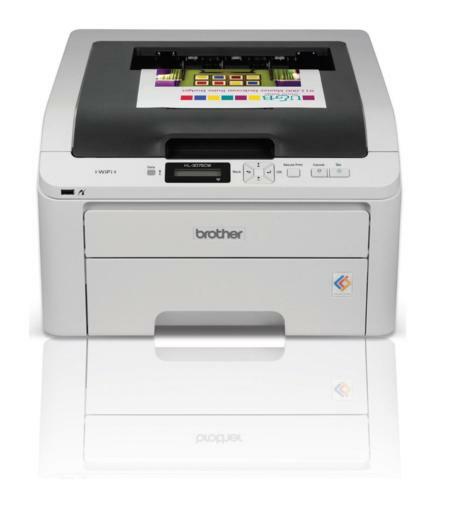 This is a colour LED (laser) printer supporting PCL6 and Postscript level 3. Connection types include USB as well as built-in Ethernet and WiFi connections; network protocols include LPD, IPP and AppSocket (raw), with built-in HTTP server for browser configuration, and SMTP e-mail notification support. I connected the printer via Ethernet and powered it on; the printer acquired a DHCP address from the LAN's router and was ready to print. I configured the router to always assign the printer the same IP address, then installed an SLPR port on my computer pointing to that IP address (I used the "LPRPORTD compatible" setting). Finally, I created a new printer object for the newly-imported "Brother HL-3075CW BR-Script 3" printer using the new SLPR port, and double-checked the job defaults before testing printing from both Lucide and PMView. Documents are crisp and high-quality, as would be expected for a laser printer. The HL-3075CW (like most lasers) is not a photo printer, but for colour documents should produce good results.